Yuki Maedera was born in 1986 and is 30 years old. 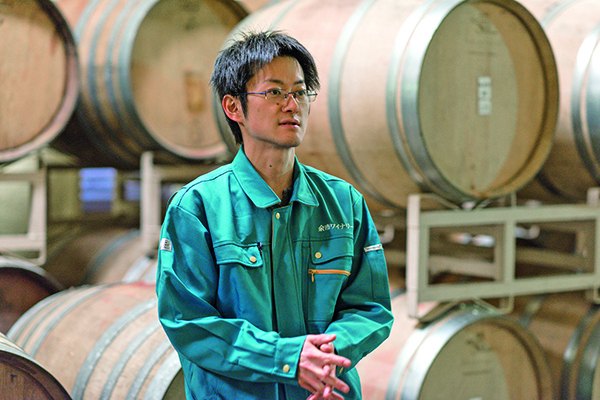 He's in charge of wine-making at Yoichi Winery. He's been at his present post since entering the company, and this is his eighth year. Six employees, including Maedera, work to make the products of the winery. The winery is about a 10-minute drive from JR Yoichi Station toward Kutchan. 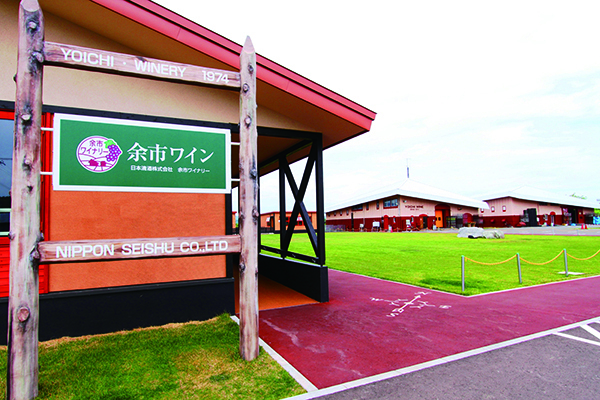 Yoichi Winery is on the premises of the Yoichi Wine Brewery. The first Yoichi Wine was vinted in 1974. With increases in the popularity of wine, Yoichi Wine Brewery opened in 2011 with the aim of having as many people as possible enjoy Yoichi Wine. With its restaurant and a photo studio & gallery, the winery is like a theme park for wine. It enjoys nearly 20,000 visitors a year. This is local wine produced in Yoichi from Yoichi grapes, based on relationships of mutual trust. We stick with the wine grapes cultivated in Yoichi and use grapes from five farmhouses in town that we contract to grow them. Mr. Maedera, who's in charge of brewing, says "To cultivate better grapes, we foster relationships of mutual trust with farmers and we keep in close contact with them. 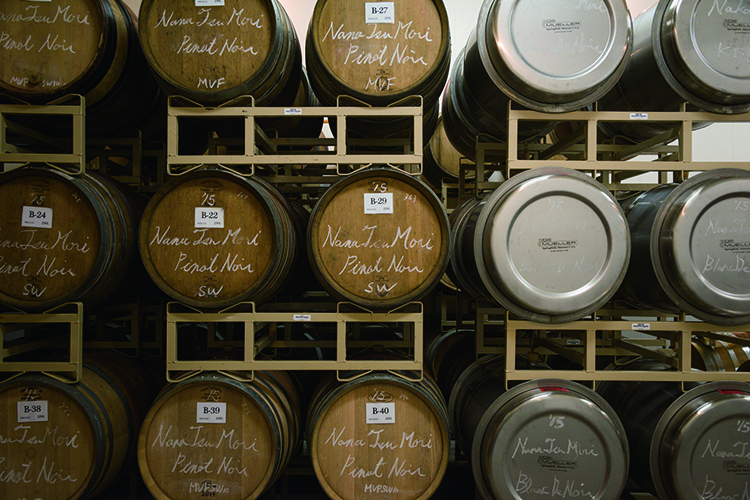 As a corporation, we acquired farms last year and plan to plant Pinot noir in April this year. We're looking forward to making wine from grapes we cultivate ourselves." Various activities, such as free tours and tastings, are offered. 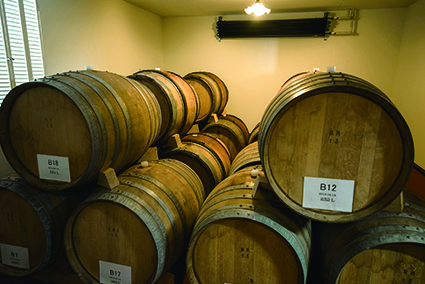 The winery was reopened in April 2013 after renovations, and a free tour project was established for the wine-making building as well as for the bottling and the storage buildings. The brewing staff guide visitors with reservations. 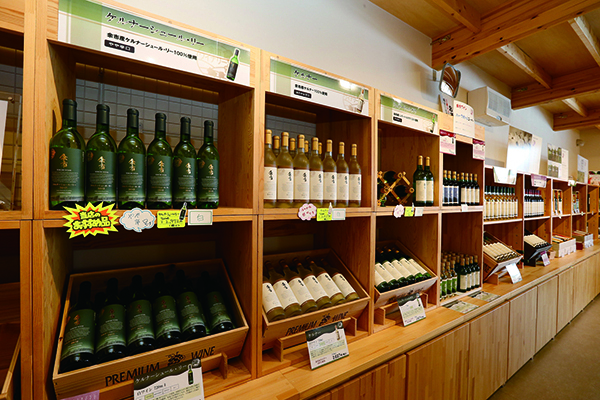 At the shop, all kinds of Yoichi Wine can be purchased, including limited-edition products. Mr. Maedera says, "Visitors can sample all kinds of wine, so please taste all sorts to find your favorite kind." It' s an ideal place to relax while enjoying wine. There's a restaurant on site. 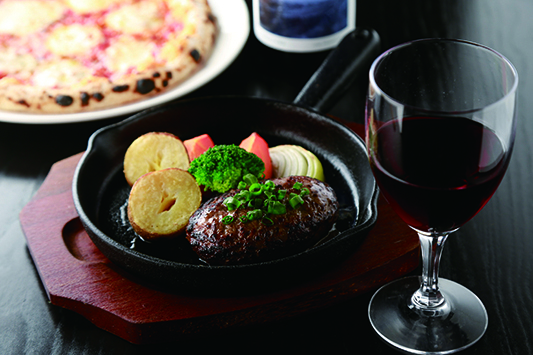 Hamburgers of 100% Hokkaido beef, pizzas baked in a stone oven, pasta made from Hokkaido wheat and more can be enjoyed there with Yoichi Wine. Kerner Sur Lie 720 ml, Zweigelt Rebe 720 ml, Muller Thurgau 720 ml, etc. These wines are sold at the shop directly managed by the winery. Online shopping is also available at the winery's website. For this wine, Zweigelt Rebe has been aged for approximately two years in old barrels. You may be surprised by the complex taste and the bouquet of the barrel that remains in this wine. Enjoy the rich taste and lingering finish. This wine goes well with meat dishes, such as sirloin steak. Mr. Soga is from Nagano and is in charge of Domaine Takahiko. He was born at the winery and worked as the person in charge of grape cultivation and procurement of raw materials at Coco Farm & Winery in Tochigi Prefecture. 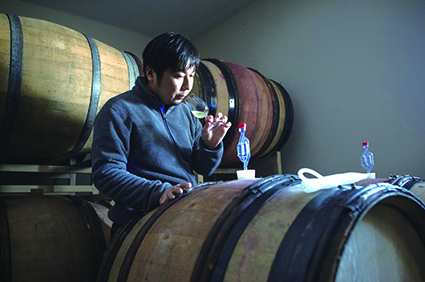 He established his own winery after moving to Yoichi Town in 2009. 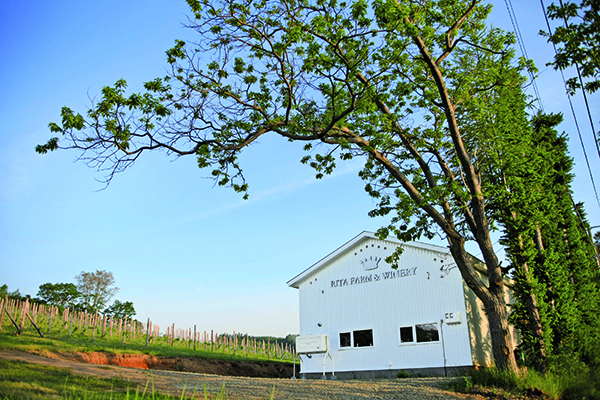 This small-scale winery has gained attention around the nation. 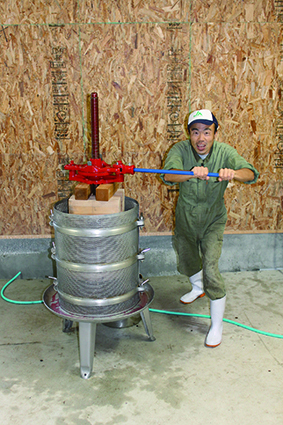 Mr. Soga, who managed Domaine Takahiko, a winery run by his family in the Nobori district of Yoichi Town, has attracted a great deal of attention as a young brewer. He's made various kinds of wine at the winery in Tochigi, and in 2009, he moved to Yoichi, as he considered the town ideal for cultivating grapes. The light, delicate taste of the wine has earned it a good reputation and deep-rooted popularity. As a vigneron, he vints natural wine by making best use of the region's natural features. Mr. Soga's wine features the Pinot Noir grape and is characterized by the particular way in which that grape is cultivated. He embodies his sentiment of wanting to be a "vigneron" rather than just an enologist. His vineyards, where seven varieties of fruits used to be grown, have recently been cultivated using organic farming methods, and Pinot Noir, a red grape that's notoriously difficult to produce, is grown there. The grape is cultivated with a minimum of trimming and a maximum of time. It's carefully raised under a meticulous cultivation method where gray mold and other adverse influences are constant risks. Mr. Soga has original ideas about vinting, and he practices fermenting methods that stress the grape as little as possible. They're fermented in whole clusters using wild yeast without egrappage, and with only a bare minimum of antioxidant added. 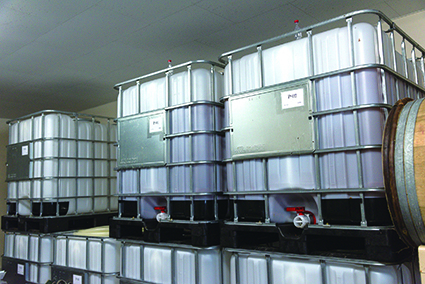 In addition, racking and filtration are not conducted. 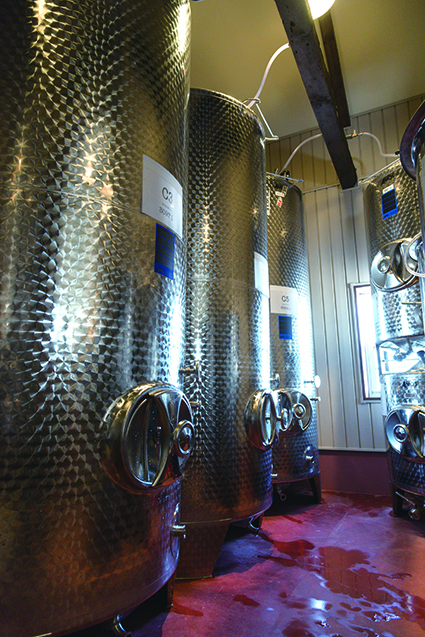 The grapes are matured in old French barrels and the botrytised wine is vinted in stainless-steel tanks. He says, "Wine that's just thick and sweet makes customers tired of drinking. For Japanese who grow up with the taste of dashi soup stock, the ideal wine is one with both richness and delicacy." Since Mr. Soga's spirit can be felt through the wine, Domaine Takahiko wines may gain popularity. Direct distribution is not available, and customers may purchase the wine by drawing lots at liquor shops. This is the light-color, pleasant, full-body wine. With this fruity wine, you may also feel the smell of woods. This wine features its delicate and rich taste as well as long-remained lingering palatability. Mrs. Sugawara is a female vintner who takes an active part in the Rita Farm & Winery established by her husband. She's from Yoichi Town. She's had experience vinting wine six times in Champagne, France. This winery on a sunny hill specializes in whites. Rita Farm & Winery, managed by Mr. and Mrs. Sugawara, was the first organization to be registered under the Special District for Yoichi Wine. Built in 2013, it was the third winery to be established in the town. The winery was named after Rita, the wife of the founder of Nikka Whisky, who became famous from the serial morning drama Massan, on NHK TV, because a next-door neighbor of Mr. and Mrs. Sugawara had taken care of Rita. Yuriko, who used to play an active role in importing wine, came across an organic wine that was unusual in agreeing with her health, so she wanted to vint that kind of wine herself. She learned how in France, and she now puts her talents to full use at the winery. 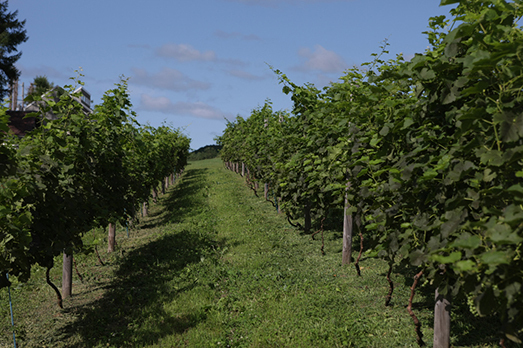 Since winds blow from the south to the sea through vineyards on sunny, scenic, south-facing slopes, the fields of this winery have been called "a vineyard of wind." Mainly varieties of white grapes associated with Champagne are cultivated here using a bare minimum of agricultural chemicals. To make the grapes more hardy, a compost of strained grape lees, yeast for fertilizer and composted seafood caught in Yoichi Bay is used. In addition, Sugawara's ruling passion is expressed by the impressively clean white building. An old fermenting method is adopted that was used more than 100 years ago and that minimizes the use of machinery, and the grapes are fermented using wild yeast. 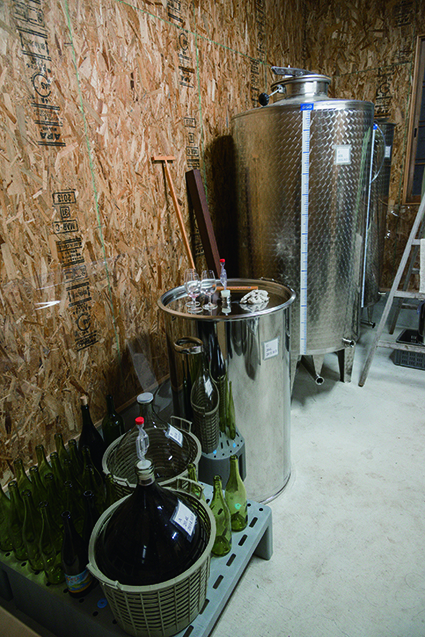 In addition, the wine is transferred and bottled only by gravity, without the use of pumps. As little antioxidant as possible is added. These procedures embody Mrs. Sugawara's idea of not stressing the grapes. Not only is the taste of the carefully made wine charming, but so is the label. It was designed by Yuriko’s husband, Masato. In addition, a guest house is planned for the top of the hill where visitors will be able to enjoy wine and cuisine. 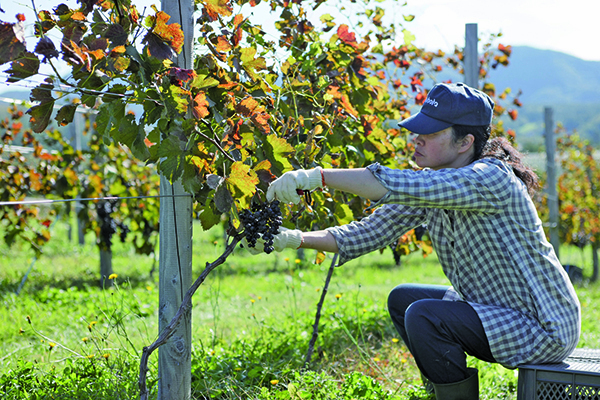 Mrs. Sugawara described her ambition: "It's my wish to realize a community where visitors appreciate wine while enjoying Yoichi's scenery and beautiful fields." Pinot noir, Chardonnay, Merlot, Sauvignon blanc, etc. "Vineyard of Wind" Merlot 750 ml, Pinot noir 750 ml, Chardonnay 750 ml, etc. You can buy these at the winery and at liquor shops in Hokkaido. Enjoy the strong bouquet, sourness, smoothness and freshness of a wine carefully fermented using wild yeast. This wine pairs well with Hokkaido vegetables and dairy products, making it the perfect apéritif. 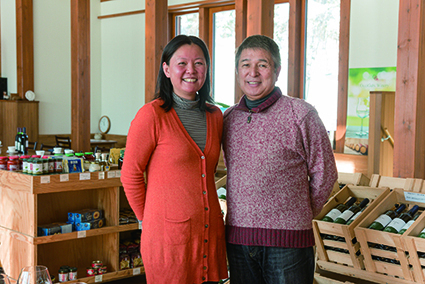 Kiichiro acts as the managing director of the winery, and Masami is the representative director. Kiichiro graduated from the West Germany National Wine School. After returning to Japan, he vinted wine in Hokkaido and Nagano, and established OcciGabi Winery in 2013 following the establishment of a winery in Niigata in 1992. This winery on a gentle slope was named OchiGabi by combining the husband's last name (Ochi) and the wife's first name (Gabi, as read using the Chinese-derived pronunciation for the Japanese character). Kiichiro, who has long experience in wine making and in the establishment of resort wineries, moved to Yoichi in the hopes of creating a beautiful winery in the finest wine production area. The modern wood and concrete building houses a winery, a restaurant and a shop, and visitors can enjoy a factory tour as well as meals and wine at the restaurant while admiring the vineyards. A belt conveyer and a wine press are installed in the vinting facility beneath the building. Since fresh grapes harvested in the morning must begin fermentation on the same day, efficiency is regarded as important here. Stainless steel tanks are used for fermentation, and the grapes are matured for half a year in new oak barrels under strict temperature control before being aged in bottles for completion. Mr. Ochi says, "The most important thing in making wine is the grapes themselves. 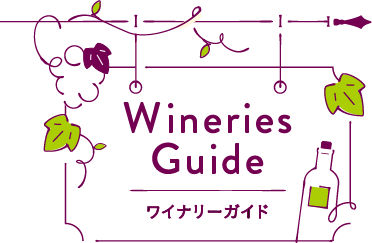 I want to vint wine by taking advantage of my long experience, while carefully selecting grapes and fermenting methods in Yoichi, where delicious grapes can be harvested." Mr. Ochi shares his dream: "I want to turn Yoichi into Napa Valley, the hallowed place for wine industry in the United States." He adds, "To make this dream come true, I'll need to make my winery outstandingly scenic. I want to make this site one where visitors can enjoy themselves no matter how many times they come back, and I want to do this by expanding the community through wine, including by featuring the bakery at this winery." The world of "OchiGabi," a world where you can enjoy the scenery as much as the wine, will continue to spread. There is also a restaurant. 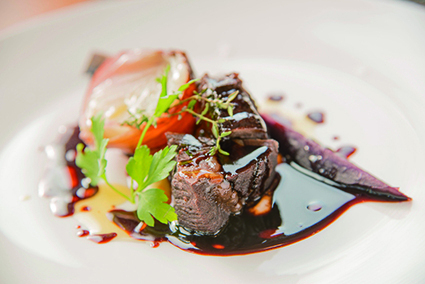 The photo shows an example of the prix fixe dinner. In an open, circular space, savor wine and French cuisine cooked using fresh ingredients, while admiring a vineyard that looks different from season to season. Pallas, Pinot gris, Gewürztraminer, Cabernet Kubin, Pinot noir, etc. Zweigelt Rebe 750 ml, Dornfelder 750 ml, Kerner 750 ml, Bacchus 750 ml, etc. These wines are sold at the shop directly managed by the winery and at liquor shops. Online shopping is also available at the winery's website. This is popular wine is made by blending four varieties of grapes: Cabernet Kubin, Cabernet Mitos, Cabernet Dorsa and Pallas. It's fermented to have a richer taste by using the barrels to impart their aroma. Mr. Konishi is from Akita. He moved to Yoichi Town in 2009 after working in an office in Tokyo. He began to cultivate grapes on his own farm in 2011, following a two-year apprenticeship with a farmer. He is a young winemaker who obtained his license in 2014. He moved to Yoichi from Tokyo out of a great enthusiasm for wine. Konishi moved to Yoichi from Tokyo with his wife because he loves wine. The vast fields in Yoichi and the potential of the town attracted him. After learning how to cultivate grapes from a grape farmer in Yoichi and how to make wine from Bruce Gutlove in Iwamizawa, he finally opened his winery in 2014 on the premises of his house in Yoichi. The couple work by themselves to cultivate and vint grapes. Mr. Konishi uses only the Zweigelt Rebe variety. He notes that his policy is "Be the grape." He wants to cultivate grapes as naturally as possible by determining what environment is pleasant and comfortable for grapes. The carefully raised grapes are fermented in a 12 tatami-mat space that was created through home renovations. He aims to vint wine with a complex taste that achieves harmony between sweetness and acidity and that uses wild yeast and tank fermentation. Nobori Jozo Winery was named after the Nobori district of Yoichi Town, where this winery is located. Mr. Konishi says, "When I came here for the first time, I recognized how beautiful it was and how it was the best place to make wine, thanks to the scenery of the gently sloping hills. I want to pursue a style of my own by using wild yeast and grapes grown in this blessed environment." A distinctive wine that distills the beautiful scenery of the Nobori district and the Konishis' passion will be sold in early 2017 under the name of Nobori Jozo Winery 2015. The taste of the newly sold wine and the Konishi's future challenges are expected. There is great anticipation for the taste of this debutante wine and for the Konishis' endeavors. You can buy these at liquor shops in Yoichi, Sapporo, Tokyo and elsewhere. Quantities are limited. This rosé wine is made with the same method as for white wine, but with the Zweigelt Rebe red grape. Appreciate the fruity bouquet, the fresh, rich taste and the sweetness. Mr. Suzuki is from Sapporo. He moved to Yoichi in 2012 after getting interested in grape cultivation through his wife, a wine enthusiast. He's a young brewer who opened the winery in 2015 after training under Mr. Soga of Domaine Takahiko. 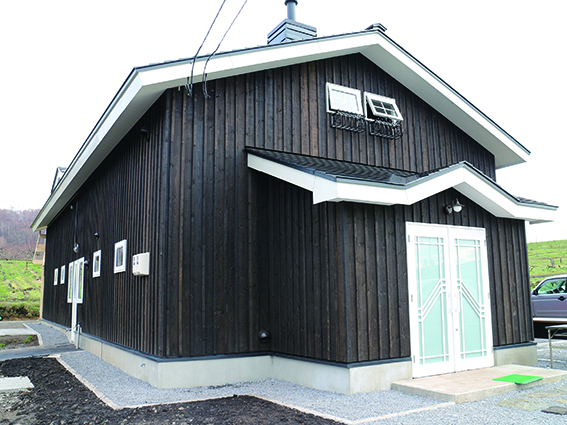 This small winery was established by renovating a warehouse made of a stone called Sapporo soft stone. Mr. Suzuki moved to Yoichi in 2012. He loves wine so much that he drinks it every day, and he was fascinated by the taste of the vintage wine produced at Domaine Takahiko. He then began to learn wine-making from Mr. Soga, and he opened a winery and named it after himself in 2015. The couple vints wine in a warehouse they renovated. The warehouse, which is made of a stone called Sapporo soft stone, used to store apples. 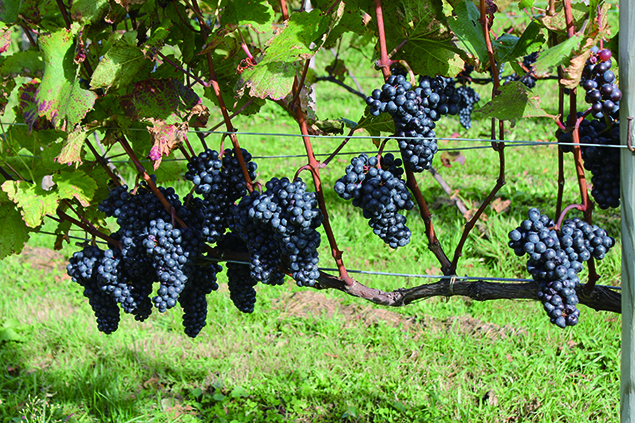 Five varieties of wine grapes, including the German Zweigelt Rebe, are cultivated at his 5.6-ha field, which he inherited from a grape farmer. Most of the grapes are shipped to wine producers, but he also tries his hand at making wine himself, using organically grown grapes. 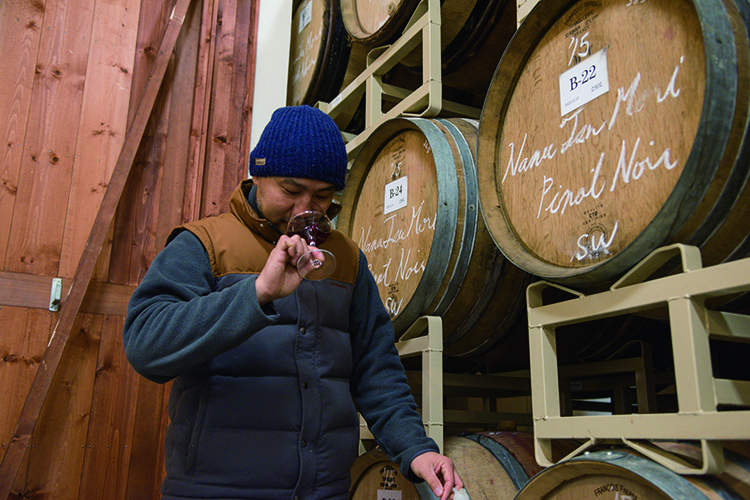 Mr. Suzuki aims to vint wine as naturally as possible. 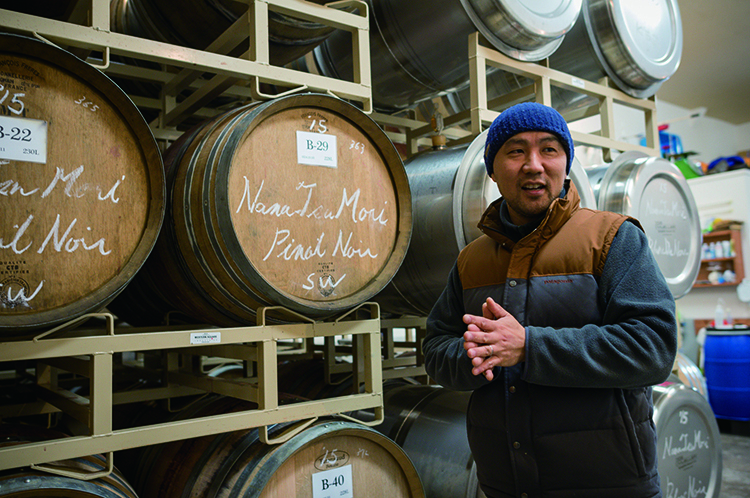 Mr. Suzuki aims to make his favorite: wine as natural as possible. From trimming to harvesting, the cultivation of wine grapes is time consuming, since he uses the bare minimum of agricultural chemicals. He aims to cultivate organically grown wine grapes with the minimum necessary care. This idea is also reflected in the wine making, as seen by the use of wild yeast and a minimum of sulfurous acid (antioxidant). The fermentation tanks aren't stainless steel; instead, they're synthetic resins. And the grapes are matured in old barrels. Lees are removed without pumps but utilizing gravity, so as to avoid stressing the grapes. Mr. Suzuki says, "Our policy is to do by hand whatever we can do by hand. We use lots of manual procedures, and in doing these we take care to avoid affecting the flavor of the grapes. But I believe we can achieve a deliciousness of our own by minimizing the hard labor." He intends to increase his yields, and he tries to cultivate new varieties of grapes after transplanting existing varieties. His struggles are gaining attention. Zweigelt Rebe is blended with white wine grapes. The wine is slightly cloudy, since it's not filtered, and you can enjoy its simple taste. This light, pleasant wine is recommended as a table wine. Mr. Hirakawa is from Tokyo and is the representative director of Hirakawa Winery. He went to France when he was 22 years old and learned how to make wine at a winery in France, earning the national qualification of a wine vintner, the qualification of sommelier and other certifications. He entered Hokkaido Wine Co., Ltd. in 2011 and established Hirakawa Winery in 2015. Hirakawa Winery was only just established, in 2015. 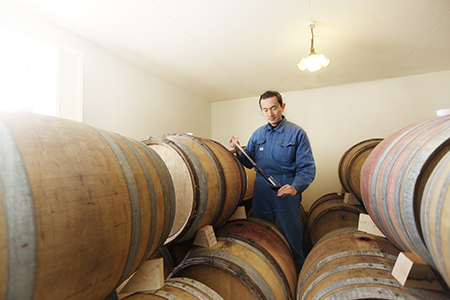 Mr. Hirakawa, the representative of the winery, and his staff vint high-quality wine in a renovated building that was an old warehouse constructed by the former head of the farm. Mr. Hirakawa has a unique background. He's the only Japanese person to have graduated from the agricultural department of a most prestigious national institution of higher education in France. 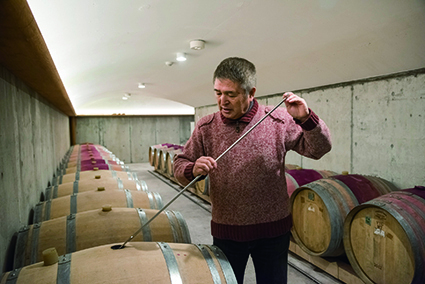 He then gained experience in various grape cultivation methods and in wine making at famous wineries in France. After returning to Japan, he took an active role as a chief sommelier at the Windsor Hotel Toya. Mr. Hirakawa decided to make wine after tasting the premium whites produced in Yoichi during his career as a sommelier at Toya. "Grapes produced in Yoichi are rich in bouquet and flavor," he says. 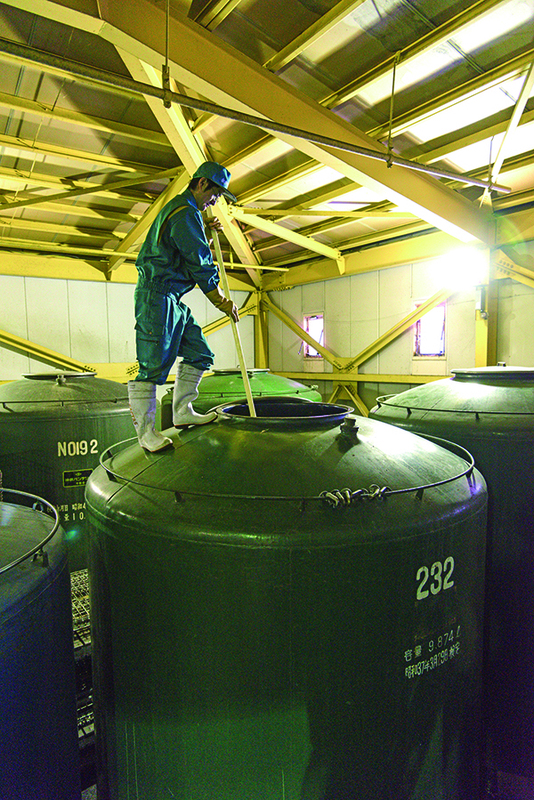 "I was certain I could vint world-class wine in Yoichi." He set out to grow grapes on his south-facing fields, which are on the slopes of a hill, after learning techniques for cultivating grapes in a snowy region. 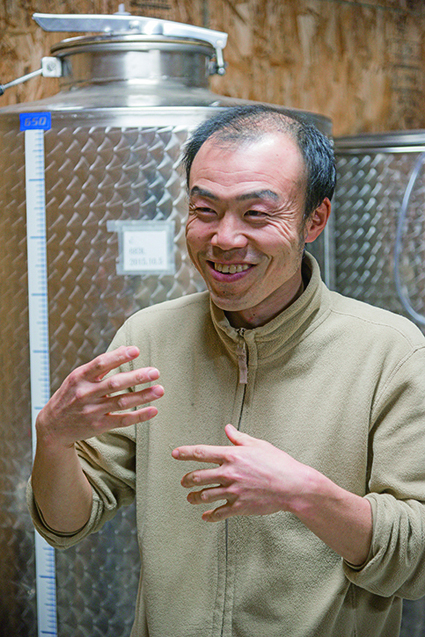 Since the soil also influences the quality of wine, he tries to make wine that expresses Yoichi's distinctive climatic and topographic features while considering the importance of the ecosystem and pursuing his concept of making unique wine in the field. 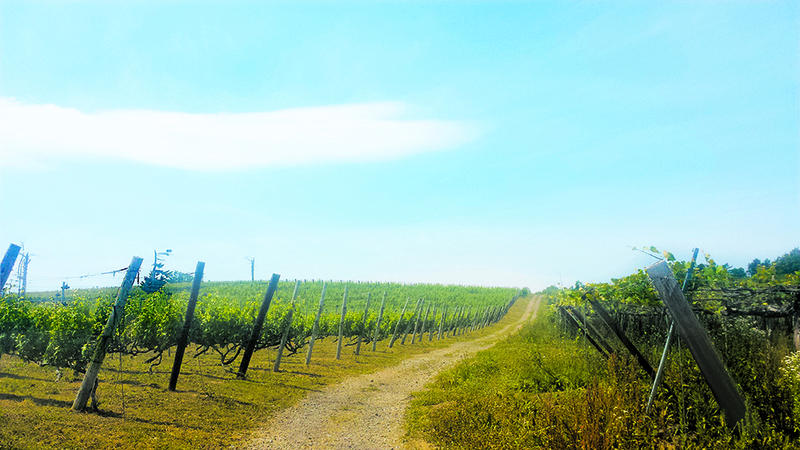 Mr. Hirakawa intends to begin the winery from zero by changing the varieties of grapes planted in the field this year. 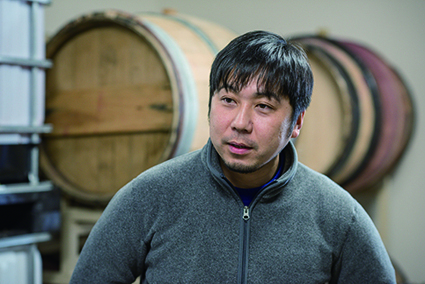 Vines of the Kerner variety, the variety that drew him to Yoichi, are scheduled to be predominantly planted, and he intends to make world-class wine by applying the knowledge and wine-making techniques he learned in France and his experience as a sommelier. Also a sommelier, Mr. Hirakawa says, "To vint premium wine, it's important to know how wines from around the world taste. My ideal wine is one that can be enjoyed with the cuisine Hokkaido, a kingdom of culinary delights. I intend to create wines that pair superbly with food at restaurants and at home, in addition to being appreciated on their own. 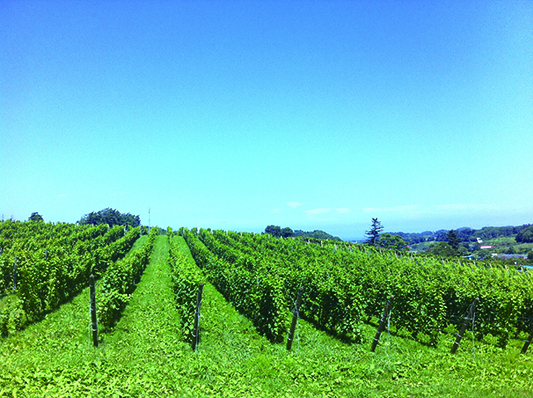 Grapes of the Kerner variety cultivated in Yoichi are vinted by Hokkaido Wine Co., Ltd. to realize this wine. It's a semi-dry white that has the rich, pleasant, well-balanced flavors of fruit, fresh acidity and slight sweetness.